I’ll never forget vacationing in Thailand, trying to decide whether to buy a pair of jadeite earrings. The beaming salesman chanted to me, “Burmeeeese jade,” with a knowing nod. His smile implied that nothing could be better. Imperial-quality jade. Courtesy of Mason-Kay. That was about eight years ago, when jade and rubies from Burma (Myanmar) were banned from the United States. Retailers in the U.S. could not sell them. Wholesalers could not import them. Well, that recently changed, and the announcement got me interested in the story of how these gems came to be sanctioned. It was back in 2003 when George W. Bush signed the trade embargo, prohibiting the import of Burmese goods. The military ruling group, the “junta”, of the country had imprisoned the people’s leader, Aung San Suu Kyi. Citizens of the country were having their human rights violated. The embargo was a response to what was considered an unacceptable way to govern. But there were loopholes in the 2003 document, and Burmese jade and rubies still found their way into the U.S. If a “middleman” country got involved, either in the cutting or polishing step, it was still legal to import these gems to the U.S. That is, until July 2008. President Bush signed a new document, the Tom Lantos Block Burmese J.A.D.E. (Junta’s Anti-Democratic Efforts) Act, which closed the loopholes and effectively banned the import of ALL precious Burmese gemstones. Wholesalers and retailers selling ruby and jade needed documentation to certify that the gems had not originated in Burma. The jewelry industry was negatively impacted by the embargo. Burma was considered the best source in the world for fine ruby and jade. Different sources of the gems had to be found, and, over the years, they were. Today many rubies come from Mozambique. 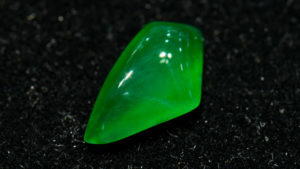 Jadeite sources include Guatemala, Japan, and Kazakhstan. The trade sanctions had the desired effect. Myanmar began to make reforms in 2010. Over the next couple of years, democratic elections were held and many political prisoners were released. In 2011, the U.S. appointed an ambassador, and, in 2012, President Obama visited the country. Using a cautious approach, President Obama lifted some of the sanctions in November 2012. But the ban on rubies and jade remained in place. Aung San Suu Kyi, who is now the nation’s State Counsellor (sort of like a Prime Minister), expressed patience, saying that “We believe that if we are going along the right path, all sanctions should be lifted in good time.” And she was right! On October 7th, 2016, President Obama signed an executive order to lift the remaining trade sanctions against Myanmar. It will be interesting to see how this executive order influences the jewelry industry in the coming months and years. It will take some time to establish or re-establish relationships with Burmese stone dealers. 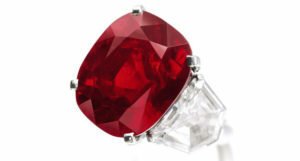 But I believe it won’t be long before we see the deep blood-red Burmese rubies back in our stores. And my “Burmeeeese” jade earrings (Yes. . . I bought them) may soon be easy to find in the United States. If it’s Red, is it Real? 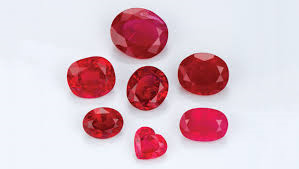 Most of us know that not every red gemstone is a ruby. Garnets, tourmaline, and even diamonds can be red. But if you are in the market for a ruby, know that many substitutes exist. I recently put on a seminar about rubies, their imitations, and synthetics. Let me share three pieces of advice on buying a ruby. 1) Buy it from an A.G.S. member store. Only jewelry stores who adhere to the strict consumer protection standards of the American Gem Society will have the A.G.S. sign by the front door. These stores are required to be informed on ethical issues and questionable practices facing the gemstone and jewelry industry. 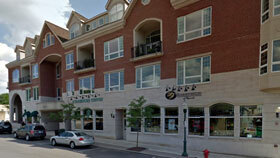 At least one employee of the store must be a registered jeweler, which requires yearly testing to renew the designation. 2) Look at that beautiful stone under the microscope. All A.G.S. member stores are required to have a microscope at their store. Ask to look at the piece you’re considering. If the stone shows some inclusions under magnification, especially whitish or colorless rounded crystals or a lacy-looking fingerprint, that’s a good sign. Be suspicious of a stone that looks perfect under magnification. Natural rubies generally have inclusions. Remember to ask about treatments on the stone. Most rubies have been heat-treated to improve their color and sometimes their clarity. Heat treatment is permanent and does not affect the durability of the stone. If the stone has fractures that have been lead glass-filled to enhance the clarity, it is not as valuable as one that has not. In fact, most gemologists feel that these “composite rubies” shouldn’t even be called rubies because so much of their weight is due to the lead-glass. Be aware that a glass-filled stone is not durable and should never be subjected to heat or an ultrasonic cleaner. 3) Don’t assume that, because it’s old, it’s real. Synthetic rubies have been produced since the early 1900s. Rubies were also imitated using glass, assembled stones of garnet and glass, and other natural red stones like spinel. 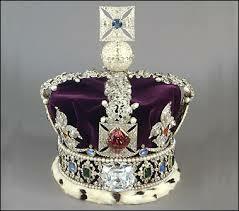 Even the “Black Prince’s Ruby” in the British Imperial Crown is actually a 170 carat red spinel!